According to legend, he signed his name so large and clear so that King George III could easily read it without spectacles. Did John Hancock always sign his name this way? If you take a look at these documents from the Papers of the Continental Congress, it looks like John Hancock always signed his name this way. 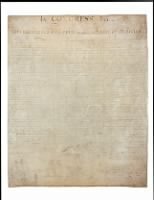 He either liked his signature so much from the Declaration that he used it that way from there on forward or he always wrote his signature that big.